Amazon Elastic Compute Cloud (Amazon EC2) provides a wide selection of instance types and sizes optimized to fit different use cases, giving customers the flexibility to choose the appropriate mix of resources for their applications. Amazon EC2 generates detailed usage data to help determine the right sizing of their Amazon EC2 resources, which indicates whether they are using the most cost effective instance to meet the technical requirements of the given workload. 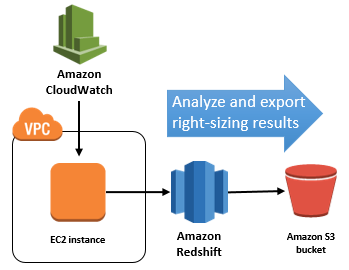 AWS offers the Cost Optimization: EC2 Right Sizing (EC2 Right Sizing) solution, an automated reference deployment that analyzes of two weeks of Amazon EC2 utilization data and provides detailed right-sizing recommendations to meet the current demand while reducing the overall cost to run the workload. The solution leverages AWS managed services, enabling deployment in a highly available and affordable way. This guide provides infrastructure and configuration information for planning and deploying the EC2 Right Sizing solution. The following sections assume basic knowledge of Amazon EC2, Amazon Redshift, and Amazon CloudWatch. It is also helpful to have working knowledge of comma-separated values (.csv) files and Microsoft Excel. You are responsible for the cost of the AWS services used while running this reference deployment. As of the date of publication, the cost for running EC2 Right Sizing with this solution’s default settings in US East (N. Virginia) Region is approximately $0.65 per hour. This reflects Amazon Redshift and Amazon EC2 charges. You will also incur variable charges from Amazon Simple Storage Service and Amazon CloudWatch. For full details, see the pricing webpage for each AWS service you will be using in this solution. Note that this solution is intended for temporary use; after you deploy the AWS CloudFormation stack and save the results, you have the option to automatically delete compute resources to stop incurring unnecessary costs. You can deploy this solution as often as necessary to reanalyze your Amazon EC2 sizing.